Want to read more? Visit Mary's related blogs for deeper insights on Alzheimer's disease, family, health and more. Caring for someone with Alzheimer’s disease is like navigating a voyage on the high seas. The journey requires steady, ongoing mental and physical stamina as well as heavy doses of love and patience. Navigating Alzheimer’s by Mary K. Doyle is a guide to assist travelers on this path. Navigating Alzheimer’s is empowering, supportive, and sympathetic. 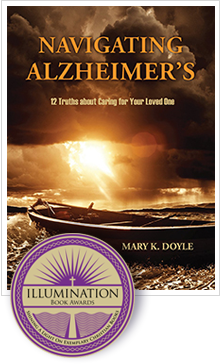 Written specifically for primary, family caregivers to people with Alzheimer’s, the book also is helpful for friends and other family members of loved ones with Alzheimer’s. In the opening pages of Navigating Alzheimer's, Mary K. Doyle summarizes the demands of caring for a loved one with Alzheimer's, but also refers to graces to be found in tender, loving moments. Doyle is a journalist with a master's degree in pastoral theology. Her husband, Marshall, is a professional entertainer who has Alzheimer's, and was under his wife's personal care for nine years before she called in professional helpers and eventually moved him to assisted living. The book is laid out in a format that makes the most of the content. Each chapter begins with short paragraphs entitled "What It's Like" and "What I Learned" and ends with a "What To Do about the Future" list. The meat of each chapter may contain statistical information about Alzheimer's, vignettes to illustrate situations, and lists of practical steps; for example, how to enlist help from family members or hire a caregiver. In a chapter titled "Alzheimer's Prompts Perpetual Mourning" Doyle writes of "an unstinting stream of loss...as changes gnaw away at what was ours." She describes sitting alone on her deck in the evening, recalling the days when she and her husband shared those moments after dinner. "Little bits of the person we know and love, and our relationship with them, continue to disappear," she writes. And What To Do? Lean on faith, family, and friends; stay present and learn to enjoy what you have with your loved one; seek counseling, exercise, rest, and good nutrition for yourself, without guilt. She addresses guilt elsewhere in the book, especially in dealing with symptoms of the disease as extreme agitation, false accusations, and hurtful remarks. We need to remain calm and, sometimes, resort to misdirection and outright lies to keep our loved one safe and on track. At the same time, we try to act with compassion and respect, letting go of personal pain. This wonderful book from Mary K. Doyle can surely help. If someone dear to you has been diagnosed with Alzheimer's disease, it's difficult to know exactly what to expect or how to handle future interactions with them. Just as the title suggests, this book navigates you and encourages you through a process which is inevitably going to be strenuous on your family and your afflicted loved one. As someone with a parent who is approaching the late stages of the disease, I really wish this book would have been around years ago. There are a lot of critical decisions which need to be made early on and even more decisions later in the process as you try to figure out what the best environment for them is. The book outlines these important decisions and helps you understand when the best time to address each will be. What I appreciated most about this book was the perspective on how to cope with the array of emotions we go through. Though each of our circumstances with Alzheimer's are different, everyone feels the same pain as our relationship with our loved one... changes. Some things you won't want to hear but you do need to hear. For me, the advice on letting someone outside the family share the burden hit close to home. You feel like you're the only one who can care for your loved one the way they need to be cared for, but in doing so you eliminate a lot of options which are objectively best for everyone. The book made the point that you can't really provide optimal care when you yourself are constantly sacrificing your own well-being (and potentially compromising your health too). There is a lot of unwarranted guilt you need to overcome because ultimately, accepting help from others will help return you to a position where you CAN give 100% again, even if it's now in a different form than it was before. I would say the target audience for this book is someone who assists in a caregiver role, but after showing the book to family members who aren't directly involved, it seems to also be a great tool to help them relate to what we're all going through. The book is only a couple days' read, but it has been well worth it for me and my family!